The annual Tokyo Marathon took place on Sunday. As one of the six events in the World Marathon Majors series, it attracts an international field of athletes, and the winner of the men’s division was Ethiopian runner Birhanu Legese, who completed the course in two hours, four minutes, and 48 seconds. Among the dignitaries waiting for Legese at the finish line were Tokyo Gov Yuriko Koike, the first woman to hold the position following her election in 2016. Koike offered the 24-year-old Legese her congratulations as she placed the winner’s medal around his neck and shook his hand, but it’s what she did with her hands afterwards that incited a backlash on social media. After posing for a photo with Legese, Koike stepped back towards the rear of the podium as another presenter came forward to place a crown of laurels on his head. At that time, Koike, feeling the chill of the unseasonably cold and rainy weather (the temperature was around 6 degrees Celsius during the race), slipped her hands into the pockets of her jacket. Unfortunately for Koike, placing your hands in pockets (whether jacket or pants) is considered an extremely casual posture by traditional Japanese etiquette standards. Even if she was no longer the center of attention, several online commenters felt that by placing her hands in her pockets, Koike was being disrespectful to Legese. 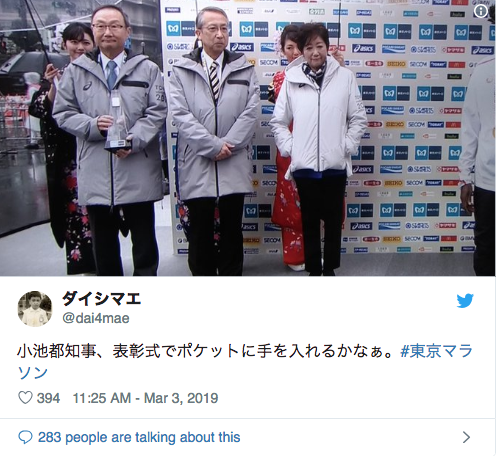 A number of commenters also called Koike out for the fact that she had a kimono-clad attendant holding an umbrella for her, while Legese was left to stand in an uncovered section of the podium as the rain that had been coming down all day continued to fall on him. It’s worth pointing out, however, that the two male presenters, who kept their hands out of their pockets, also had umbrellas shielding them at the back of the stage. Even before the social media backlash, Koike was asked about her hands-in-pockets conduct by reporters following the awards ceremony, and even she herself allowed that it had been inappropriate. “I apologize. That was rude of me,” the governor said. Some people really whine about the smallest things...get real. Seriously, the Japanese people needs to review their priorities, instead of paying attention to this trivial bs. And that is the level of intellectual discourse the media have sunk to, and the masses. There are a plethora of other more pressing things that need reporting other than hands in pockets on a cold day. A very politically motivated comment to make something meaningless an issue.. It's like that cop who was publicly castigated for drinking from...gasp...a bottle of water on a particularly hot day while on duty. Get a life, people. Pockets are for putting your hands in on cold days? Who knew! Is there a new keyboard on the market with a special 'I'm offended' button? Seems that way. Reading the comments in the article is a good way to show the expectations expected for people in leadership positions in Japan. Well said everybody. Japanese nit picking is ridiculous. They can never praise but are experts at criticizing. She is the worst governor this city ever had, infrastructure in shambles, all city dug up , major roads "renewal" is never ending and they keep digging and redigging same exact spots .. the new TM course is crap, the organisation of it is pityfull and basically a money grab ... and many more issues... Koike needs to go, she needs to be audited too to make sure there are no public trust violations. Alex compared to her predecessor she is spotless, except for putting her hands in her own pockets, rather than everyone's. Sensitivity is a worldwide phenomenon not just Japan. Remember when some American people were having a cow for Obama bowing to the emperor? Oh, good grief! Seriously? Grow the heck up! Anyone who thinks that only Japanese would make a deal of this has never seen a US Marine Corps Staff NCO. I think the expression on her face showing care for the athletes is more important. Arrant nonsense. You obviously weren't here during the reign if Shintaro Ishihara, the worst example of a politician this country has produced in postwar times. It was a miserable day, so what if she wanted her hands warm. I was, and Shintaro was miles above her in quality! Well, I’m surprised that a lot of people here don’t understand Japanese behavioural expectations - and that’s your call if you’re a Westerner. This faux paux is common thinking among Japanese with any sense of social understanding. Similar examples include: not pointing in public, not speaking loudly in a crowded train, not eating in public areas not designated for eating, not drinking while walking, not hovering over food with chopsticks or passing food from one utensil to another, not walking into other people’s houses with your shoes on, and the list goes on. Criticized for putting your hands in your pockets ... ? I've said it before and I'll say it again: this world is becoming an incredibly strange and oversensitive place. Judging by the many comments on here by people coming to her defence, maybe you should give the world a break. At least she's putting her hands in her own pockets -- not someone else's, like other politicians do. Give her a break. The weather was awful. My son shivered an hour after the race. I just got back from Japan yesterday to the states. I have been there for 3 months and had gone for months prior. While I do understand the people saying what is the big deal she just put her hands in her pockets when I’m your culture it’s probably not a big deal. Japan is a very organized and orderly country and there are a lot of rules that the Japanese people were raised to adhere to at a very young age. For example in America it is extremely rude to slurp food really loudly and against the law to drink alcohol while walking on the streets. While in Japan both of those examples I gave are not that big of an issue. Now with that established, I’d like to propose a question to the people who are saying that she shouldn’t be held to that standard, on the contrary she is the governor and was elected as such to represent the people. She knows the rules that every Japanese must follow and the fact that the people are bringing up that she was rude to a foreigner just goes to show how disappointed they are in her. It’s similar to when you get in an argument with someone and can’t understand their point of view. Just there in December. The city was not all torn up other than a still amazing amount of commercial construction going on. It's part of culture and mannerism thing, why bashing on Japanese or East Asian thing? If senior western soldier does the same thing, you'd be saying the same thing like Japanese. Someone that understands Japanese culture would know that this is a faux pas. Someone that pretends to know the culture would think it's not a big deal. It just looks a little sloppy. A nice pair of gloves don't cost much. I am often amazed at the anti-Japanese attitudes of posters to this site. Presumably if you are interested enough to post here you would have some knowledge or affection for Japan and its cultural traditions. Formality is a core part of Japanese culture. It implies respect and conveys social class. Thankfully there are cultures left that have not slouched into rude informality. It's hilarious to read all of the bashing here of a benign part of Japanese culture. It's not as if you're being asked to respect a repugnant part of a culture such as Saudis beating their wives or FGM. Koike herself realized her mistake and apologized. If Koike can be criticized for THAT, how about Abe and Aso being criticized for sleeping in parliament ALL THE TIME?? So many really critical issues that could be covered instead of this. Lol...stop it Alex , thats just hillarious. Precisely brother, then again whats the bet most people criticizing her are closet pro LDP dinosaur types with too much free time on their hands , you know ones who complain about kindergarten kids being too loud in their neighborhood kind. Seriously need to get some new hobby. When in Japan, act like a Japanese as best you can. Simple. It doesn't matter that the winner doesn't know or care that her hands were in her pockets. It is the Japanese way. i wouldn't put my hands in my pockets in that situation and i don't think it's too much to expect a dignitary not to either. yes, it's a tiny thing, but it is bad manners, plain and simple. How much 'outrage' really was there? The media loves to stir controversy by picking out a few 'outraged' tweets. Anything to stir up the masses and garner more clicks. If I was in Japan on a cold day and didn't have gloves, yeah, I would put my hands in my pockets to keep them warm too. I think certain "cultural expectations" should be relaxed in certain situations. Is this really worse than dozing off during Diet sessions (even when you are being asked a question)? Be yourself, as they say.